We get a lot of cases from companies like Antec, Silverstone, and NZXT—companies that have been in the business a while. Every so often, though, a company new to the field decides to send something our way. That’s the case today, as Microcool has sent us their first attempt at grabbing a foothold in the PC case market, the Banchetto 101. The Google translate-o-bots tell me that Banchetto is Italian for feast or banquet. We’ll see soon enough if this case fills the bill, or leaves us hungry. Banchetto 101 is Microcool’s response to the needs of untold modding devotees and PC professionals. The fruit of two years of development, Banchetto 101 represents a veritable revolution in the domain of cases. Open, light and transparent, its innovative structural design enables easy access to all components of the system, and allows rapid substitutions and total real-time monitoring. In addition to the main features of the PC, Banchetto 101 has been designed to integrate internally, in a safe and functional manner, the installation of water cooling. 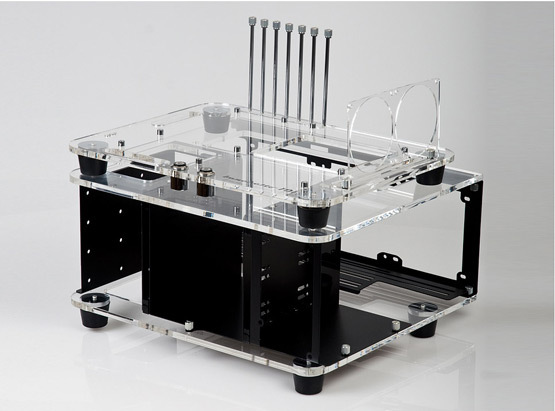 Microcool has invented the first case that is not an obstacle to your desire to experiment. Banchetto 101: the case that is there but that you cannot see!